.The Kitchen is the perfect play kitchen for tiny chefs and bakers to experiment with new meals for friends and family. The Kitchen includes 4 hotplates, turnable knobs, oven with window, water tap and sink, and a kitchen cupboard with curtain. 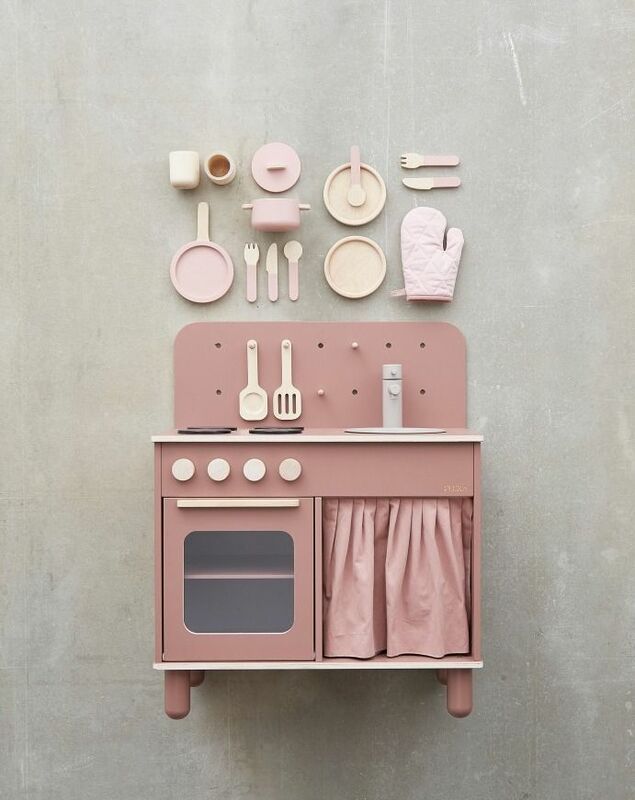 The Kitchen in dark rose is made of high quality birch wood, plywood and MDF with 100% cotton curtain, powder coated steel sink and oven window in plastic. The trendy colour and rounded design ensure that the product looks good in any room of the house. There is no visible hardware. The Kitchen is the perfect gift to encourage hours of role play fun, thus helping children develop their social skills. Add more fun with the Pot & Pan, Tableware, and Chef’s costume from The TOY Collection. A U K A H L U T I R E R U S E L D I R S É R.
ATH: Aukahlutir eru seldir sér. A Kidsconcept Allt fyrir vöflugerðina. Tilvalið fyrir eldhúsið og í vöflugerðina. Vöflusettið margfræga!